A group of historic farm buildings have been converted into a fascinating visitor centre for the Pendle Area. 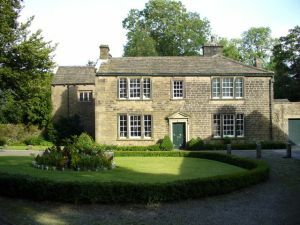 Located only a mile from the M65, the Pendle Visitor Centre offers a museum, exhibition Centre, tourist information centre, visitor facilities, and an 18th century walled garden. The visitor centre stands beside a crossing of Pendle Water that has existed for centuries. The centre is based around a medieval farmhouse called Park Hill. The farmhouse, which dates to at least the 15th century, has been carefully restored using traditional methods, and now provides a museum and exhibition space depicting life in the 17th century. Exhibitions include a look at the history of the house and how it grew from a simple timber-framed building, including the story of the Bannister family who lived here in the 15th century, and the Swinglehurst family who lived in part of the house during the 18th century. A special exhibition tells the story of the (in)famous Pendle Witches trial in 1612. You will also learn about the many possibilities for recreation in the Pendle area, including walking trails, and the historic places you can visit.